Parents in the modern age often wonder if the increase in technology is increasing the space between them and the children that will eventually bury them. 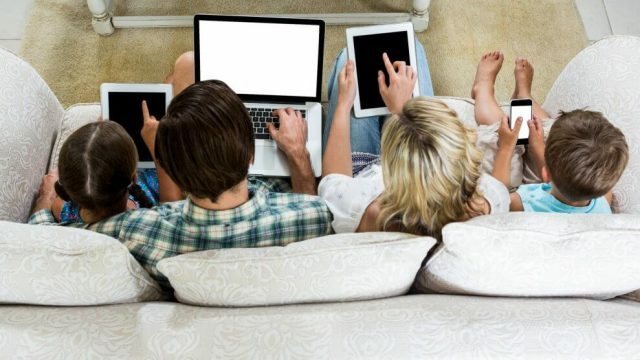 As it turns out, families who screen together, stay together, as an increase in devices sees a direct increase in family time. Sort of. While families are spending more time together, they’re doing so alone. Two researchers (Killian Mullan from Oxford University and Stella Chatzitheochari from the University of Warwick) viewed time-use data from about 5,000 British families, from it, they noted a couple of spikes. The researchers discovered that between 2000 and 2015, parents with kids aged 8-16 spent 9% more time together: 379 minutes per day in 2015, versus 347 minutes per day in 2000. The families also spent roughly the same amount of time on “shared activities,” such as eating meals and watching TV. But the biggest change was the rise in “alone-together” time—that is, in the same house but not in the presence of one another. So-called alone-together time jumped by 43% over the period of study, to 136 minutes per day in 2015. “For all of the additional time they were together, children said they were alone,” Mullan said. Devices might be creeping into our activities, but they’re not taking them over. For example, the kids reported checking their phones for 90 seconds during meals. Adults reported checking their devices for twice the time as kids. Similarly, the same pattern holds when watching television, the youth checked their devices for about five out of the 30 minutes they were watching, while parents spent seven minutes on their phones during the same period.